* Joint winners Ian Russell & William Atkinson of the F Kirk cup - 14 lb 14 oz. Singles Knockout winner - Alec Bain. Singles Knockout runner up - Les Spedding. Doubles Knockout winners - Ian Russell & G Hall. Heaviest Fish in a competition - Ian Russell & William Atkinson - 14 lb 14 oz. Heaviest Fish out of competition - Paddy Hoy - 12 lb 02 oz. Christmas match winner - Ian Russell - 13 lb 05 oz - 6 fish. Christmas match Heaviest Fish - William Atkinson - 5 lb 06 oz. Greatest number of fish - William Atkinson - 95 - first recipient of the new trophy. Heaviest Bag of Fish - Ian Russell 43 lb 11 oz. 1st - M Hall - 1 lb 14 oz - 1 fish. Total weight for the season - 1,545 lb 14 oz. 25th September 1985 - William Atkinson 1 billet for 3 lb 08 oz. Sunday 13th October 1985 - Paddy Hoy 1 fish of 8 lb 01 oz. Wednesday 6th November 1985 - Andy Marr 1 fish for 8 lb 01 oz. 17th November 1985 - WSAA Annual Open Match. 23rd November 1985 - Paddy Hoy Heaviest Fish out of a match, 6 lb 12 oz. Sunday 8th December 1985 - Ian Russell 1 fish of 14 lb 14 oz, part of a bag of 43 lb 11 oz. Between 22nd December 1985 & 5th January 1986 Paddy Hoy - Heaviest Fish out of a match 12 lb 02 oz. 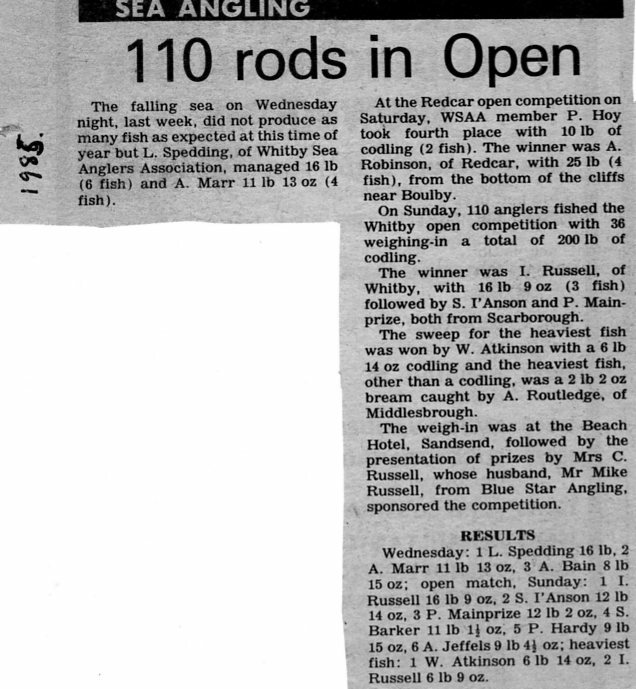 19th February 1986 - no fished weighed in!! 23rd March 1986 - William Atkinson 1 fish of 14 lb 14 oz. P Horbury - my first season with WSAA, 9 fish for 13 lb 13 oz (16th out of 26). Note:- the 1985/1986 Season started 18th September 1985. Figures entered into Excel spreadsheet. Seasons totals to date after 10 matches, 261 lb 07 oz - 236 fish. 9 lb 2/16oz - Heaviest Fish sweep winner - 6 lb 14 oz. The falling sea on Wednesday night, last week, did not produce as many fish as expected at this time of year but L Spedding, of Whitby Sea Anglers Association, managed 16 lb (6 fish) and A Marr 11 lb 13 oz (4 fish). At the Redcar open competition on Saturday, WSAA member P Hoy took fourth place with 10 lb of codling (2 fish). The winner was A Robinson, of Redcar, with 25 lb (4 fish), from the bottom of the cliffs near Boulby. On Sunday, 110 anglers fished the Whitby open competition with 36 weighing-in a total of 200 lb of codling. The winner was I Russell, of Whitby, with 16 lb 9 oz (3 fish) followed by S I'Anson and P Mainprize, both from Scarborough. The sweep for the heaviest fish was won by W Atkinson with a 6 lb 14 oz codling and the heaviest fish, other than a codling, was a 2 lb 2 oz bream caught by A Routledge, of Middlesbrough. The weigh-in was at the Beach Hotel, Sandsend, followed by the presentation of prizes by Mrs C Russell, whose husband Mr Mike Russell, from Blue Star Angling sponsored the competition. 2 - I Russell 6 lb 09 oz. Leader Board after 20 matches. Seasons totals to date after 20 matches, 747 lb 10 oz - 449 fish. Leader Board after 30 matches. Seasons totals to date after 30 matches, 1,245 lb 10 oz - 618 fish. R Goddard. Third place fell to D Perrett with a 2 lb 2 oz codling. On Sunday, WSAA gained probably the best result in the history of the club by winning the Bell trophy. Twelve members travelled to fish Scarborough and fished against seven other angling clubs from Scarborough, Bridlington and Filey, the winners being decided by the club having the best weight per number of anglers fishing. Paul Kilpatrick, of WSAA, won the sweep for the best aggregate with five codlings for 10 lb 5 oz and D Tyson, fishing for Scarborough South Cliff, caught the heaviest single fish, a codling of just over 6 lb. Fishing near P Kilpatrick at Redcliff, at the southern end of Cayton Bay, were the other two anglers from Whitby who weighed-in. These were I Russell with two codlings for 8 lb 4 oz and P Hoy, with a 2 lb 7 oz codling. 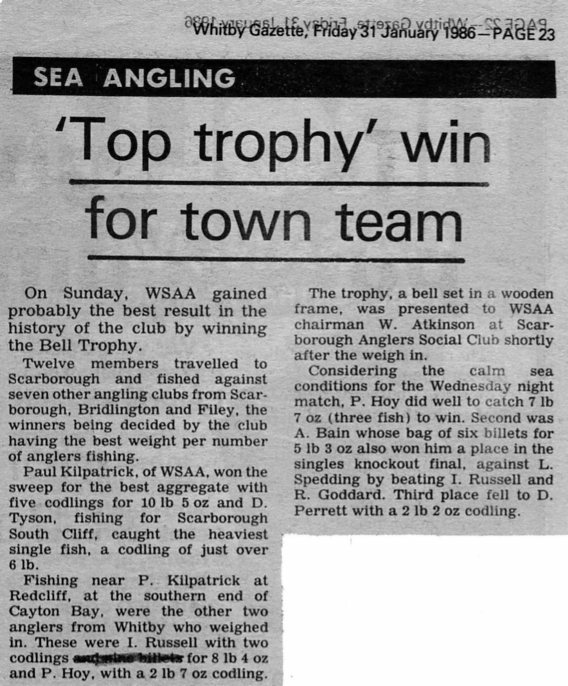 The trophy, a bell set in a wooden frame, was presented to WSAA chairman W Atkinson at Scarborough Anglers Social Club shortly after the weigh-in. Considering the calm sea conditions for the Wednesday night match, P Hoy did well to catch 7 lb 7 oz (three fish) to win. Second was A Bain whose bag of six billets for 5 lb 3 oz also won him a place in the singes knockout final, against L Spedding by beating I Russell and R Goddard. Third place fell to D Perrett with a 2 lb 2 oz codling. Leader Board after 40 matches. Seasons totals to date after 40 matches, 1,426 lb 15 oz - 681 fish. Match 42 - No fish weighed-in. Leader Board after 53 matches, done by Excel spreadsheet. Calculated - arithmetic - errors. * P Weatherill & P Horbury were placed 15th & 16th incorrectly at the end of the season due to arithmetic errors. 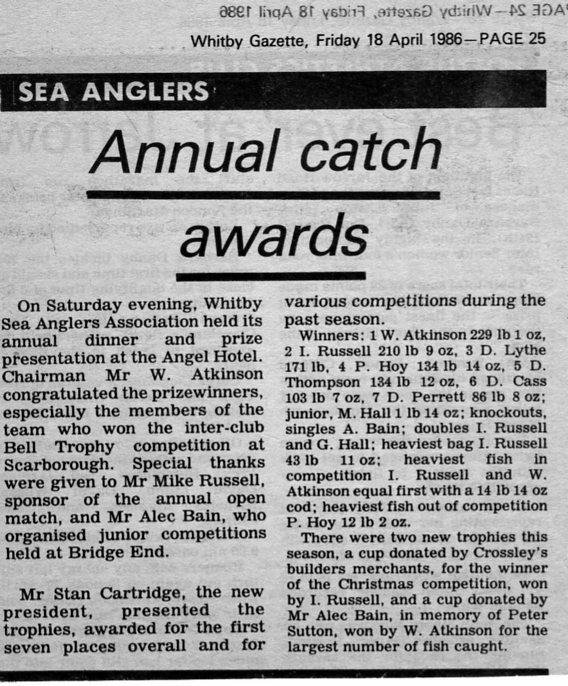 On saturday evening, Whitby Sea Anglers Association held its annual dinner and prize presentation at the Angel Hotel. Chairman Mr W Atkinson congratulated the prizewinners, especially the members of the team who won the inter-club Bell trophy competition at Scarborough. Special thanks were given to Mr Mike Russell, sponsor of the annual open match, and Mr Alec Bain, who organised junior competitions held at the Bridge End. Mr Stan Cartridge, the new president, presented the trophies, awarded for the first seven places overall and for various competitions during the past season. junior M Hall 1 lb 14 oz; knockouts, singles A Bain; doubles I Russell and G Hall; heaviest bag I Russell 43 lb 11 oz; heaviest fish in competition I Russell and W Atkinson equal first with a 14 lb 14 oz cod; heaviest fish out of competition P Hoy 12 lb 2 oz. There were two new trophies donated by Crossley's builders merchants, for the winner of the Christmas competition, won by I Russell, and a cup donated by Mr Alec Bain, in memory of Peter Sutton, won by W Atkinson for the largest number of fish caught.